Siding Spring is now just 2 days away from buzzing Mars! It is now clear that the drop in brightness we saw beginning a couple of weeks ago has continued, but fortunately it hasn't fallen off the proverbial cliff. 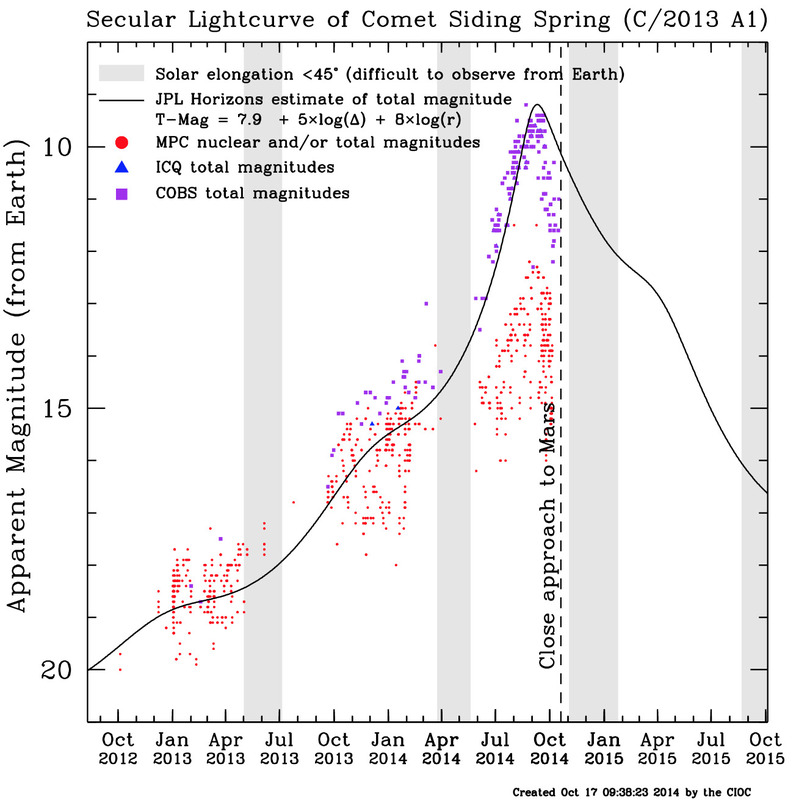 It appears that Siding Spring's rate of brightening as it approaches the Sun has simply changed in recent weeks compared to what it was doing earlier in the year. As Matthew discussed recently this isn't particularly unusual in comets like Siding Spring that are newly arriving from the Oort Cloud. We'll be posting images and news from observatories on Earth and at Mars as soon as they are publicly available. We don't know what that timescale will be, particularly with respect to the Mars teams. We've mentioned this in a couple of our blogs, but it's worth reiterating that this situation is not the same as with Comet ISON last year. With that comet, we were lucky to be observing it with the ESA/NASA SOHO satellite, which is close to Earth and sends down data in realtime. The Mars craft don't do that - it's just not part of their design. So we will have to be patient and wait for the teams to downlink and process their data. This will probably be our last light-curve update before close approach but, as always, keep checking back on this site for new blogs, keep an eye on Karl's @SungrazerComets Twitter feed for breaking news, and feel free to Contact Us with questions.